The Nine Mile Canyon Omnium consists of two stages which take place over the course of a single Saturday, starting with a Hill climb TT and concluding with a flat circuit race. Reaching into the Sierra Nevadas from the edge of the Mojave Desert, the course is scoured by wind and sand with nary an office park in sight. The hill climb begins in the stratosphere and finishes approximately halfway to the moon. The road rises brutally for 10 miles before “relenting” and letting you switch out of the 28 for a while. For a lowlander such as myself, the looming spectre of self-powered spaceflight is something that causes me to lose sleep for days. Luckily, my SoCalCycling.com / Craig Shelly teammates are less gravity-averse. Patrik Ericsson stormed the climb and took the win by several minutes while Mathew Merrington also put in a stellar ride on his shiny new team Cannondale EVO in his first race in the States. Slightly further down, Tyler Locke and I kept ourselves busy changing vast quantities of oxygen into CO2. 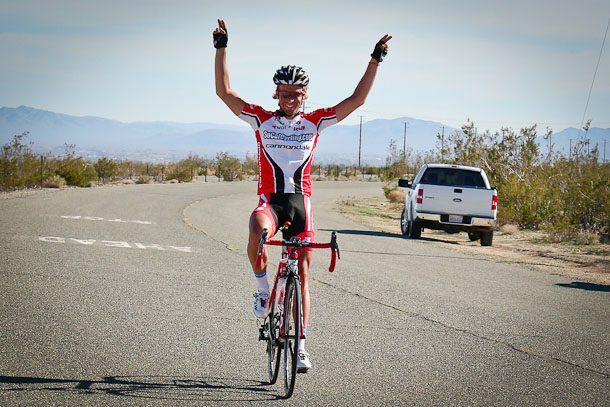 The evergreen and ever-dangerous Chris Walker (Time / Velo Pasadena) clawed his way into second place, so we knew we’d have our work cut out for us in the circuit race, defending our GC position while also going for stage honors. On a side note, I have to congratulate Anti-Gravity racing for the pretzels, fig newtons and water at the top of the climb. They were among the tastiest I have enjoyed in my life. However, someone did forget to describe the hidden 3rd stage (30 minutes of descending gnarly hairpins in swirling crosswinds) on the race flyer. The race began tranquilly, and about 3 miles in the team took responsibility for animating events. It didn’t take long before Tyler and I found ourselves off the front, which yielded a briefly invigorating feeling until one realized he’d just signed up for a 33 mile two man time trial with a wild Yeti. After establishing a healthy gap, we eased up with the idea that our teammates Mathew and Patrik could attack and bridge across to us. Visions of a four man team time trial were glorious, but not to be. Every so often we’d get a glimpse of what was happening behind as we navigated the turnarounds and crossed paths with the chasing pack behind. Patrik dangled off the front while Mathew launched himself again and again, but the pack was determined to keep the remaining gruppo as compatto as possible. This carried on for about an hour and a half. With grim determination and Scandinavian good looks, Patrik held them off for third before Mathew unleashed a righteous sprint that landed him fourth. For those counting along at home, that’s 1-2-3-4 on the stage. With the omnium points heavily weighted towards the Stage 1 outcome, we were unable to crack Chris Walker’s 2nd place on the GC. Never underestimate this wily veteran! But we did land Tyler on the podium for the Overall while defending Patrik’s lead for the Overall win, so we did not go home unsatisfied. Let it be known that the SoCalCycling.com / Craig Shelly crew is willing to step outside its element, discover new lands, and claim them in the name of our sponsors! Thank you to our SoCalCycling.com / Craig Shelly Team Sponsors: SoCalCycling.com, Craig Shelly Swiss Made Watches, Cannondale, SUGOI, Pacific Premier Bank, Echelon Design web & graphic, Full Speed Ahead (FSA), ROL Wheels, Clif Bar, Incycle, Continental, fi’zi:k, TRP, Larsen’s Restaurants, ASEA, Levi Locke and Michael Klinkenberg.